Rather than decking the office with a pool table and supplying snacks to encourage a creative, balanced workplace, companies today are recognizing that the ultimate “break” for their employees is a breath of fresh air. Outdoor workspaces are the new game room! You don’t have to be Twitter — with its 20,000 square-foot outdoor deck — to create functional, much-appreciated natural environments for your people. At Schill, we work with clients that value their outdoor living spaces and understand that giving employees access to the outside during the workday brings a business and its people great benefits, such as boosting productivity. Outdoor workspaces also give workers a chance to mingle and collaborate. Of course, you need an appropriate outdoor environment to encourage healthy breaks outside and to facilitate productive work experiences there. When we talk to our commercial clients in Northeast Ohio about creating landscapes that align with their values, which almost always includes fostering a sustainable environment and promoting community engagement, we recommend these five outdoor workspace ideas for office parks and other campus-like settings. Direct sunlight doesn’t play well with laptop screens. If the purpose of your property’s outdoor space is to provide a true al fresco work environment, then lighting is an important factor in promoting productivity. 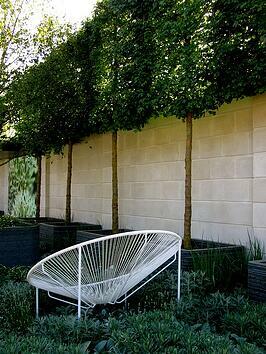 Shade is also for landscaped areas that are meant for eating lunch or simply taking an outdoor break. Who wants to enjoy an outside time-out when the sun’s beating down on them? Shade trees can help block sunlight, and canopies or pergolas are also practical ways to filter direct light to create a more comfortable outdoor space. Remember, sunlight heats up the space, too, so shade works double-time as a temperature control. Give the people who work or visit your commercial property access to wireless internet so they can either take care of business or go online for pleasure. 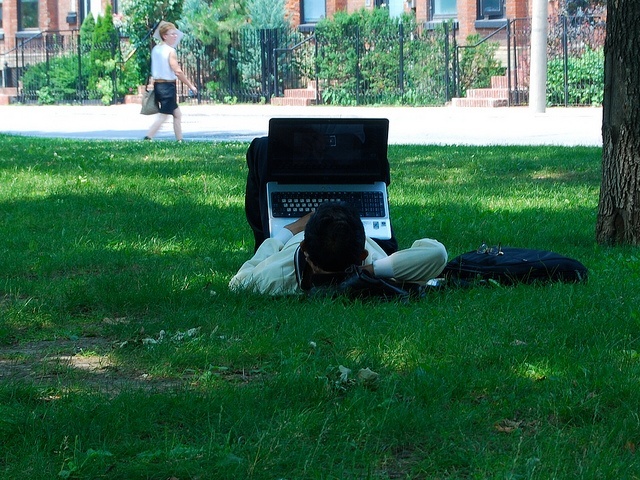 Wifi is a necessary ingredient for a successful outdoor workspace if you expect employees to take a business-minded break outdoors. And, on properties where people visit to shop, dine or do business, the convenience of outdoor wifi is a real attractor. In fact, we believe that people expect this amenity these days. If you build an outdoor living/working space for people to gather, you can expect that they will want access to the Internet. Need more landscape design tips? We’re talking about outdoor power outlets here. True outdoor work environments should include tables (or some other work surface) and power outlets where people can plug in laptops. This added convenience on your commercial property’s landscape will allow employees, or guests on your property, to see that the space is well equipped for getting down to business—or at least they’ll know they can plug in if they need to. Seating is a key consideration if the idea is to give employees a comfortable outdoor space where they can still get work done or take a break without leaving the grounds. There are a range of outdoor seating options, from patio furniture benches that can blend with the outdoor environment, to low retaining walls that double as a landscape feature and row seating. Remember to consider comfort—cushions designed to weather the elements welcome people to sit down and stay awhile. Give employees on your commercial property a way to get outdoors to enjoy some downtime by designing outdoor living rooms into the landscape. Add privacy to a patio space by strategically planting “green walls” of shrubs, ornamental grasses and layers of perennials. By planting varieties that bloom throughout the seasons, you’ll enjoy an ever-changing privacy wall of plants. Also consider incorporating walking paths into the landscape, which work double time for recreation (a brisk walk tunes up the mind) and for guiding people to gathering spaces that are isolated from high-traffic areas of your landscape—like away from parking lots, entrances or picnic areas. Functional outdoor gathering spaces in the landscape provide healthy places for employees to break out of the office. And more businesses are embracing the wellness aspects of encouraging workers to go outdoors for quick walks, lunch or to meet and get work done. Designing outdoor workspaces aligns with a greater mission to provide sustainable, community-focused environments for employees. Let’s talk more about how you can trump the old office game room and introduce a fresh work perk to your team. Call us any time at 440.327.3030, or fill out this simple contact form and we’ll get in touch with you.